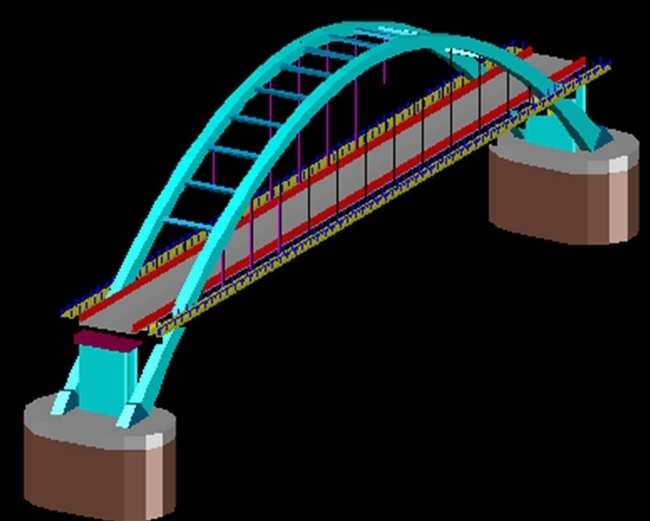 Structural design consultancy for 372m long bridge with main arch span of 120m in solid RCC, with 7 nos. 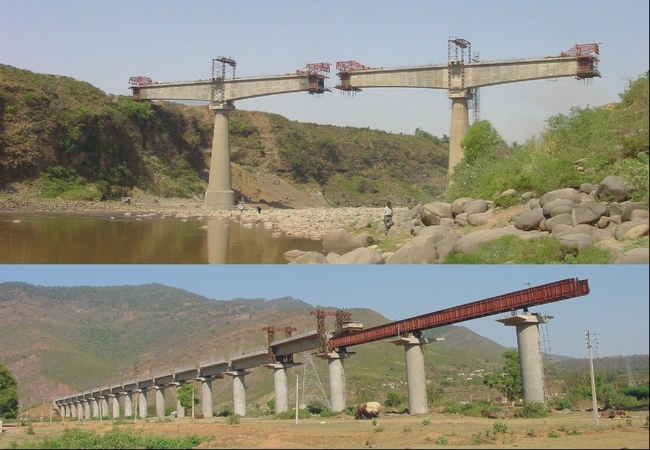 end spans and 5 nos end spans on either side, to be constructed near Kulu, to the orders of Himachal Pradesh, PWD. The arch supports a 2-lane deck slab and rests on 11m dia well foundations at each end. The Khalsa Heritage Complex is a landmark project, commissioned by the Punjab Government to depict the 500-year history of Sikhs and 300 years of the establishment of the Khalsa. The 60 acre barren site, situated in front of the main Anandpur Sahib Gurudwara has been transformed into two Complexes of innovatively designed buildings separated by a multi-span arch bridge over an aesthetically landscaped artificial lake with a coffee shop in the middle. The Main Auditorium, Library and Archives from Complex A, while the Heritage Museum Permanent Exhibit and Grant Entrance are housed in Complex B. The big structural challenge was to concretize the fantasy-like imagination of the Architects and the emergence of visually arresting shapes like a crown, a flower, a boat bear testimony to the creativity and aesthetics of its creators. 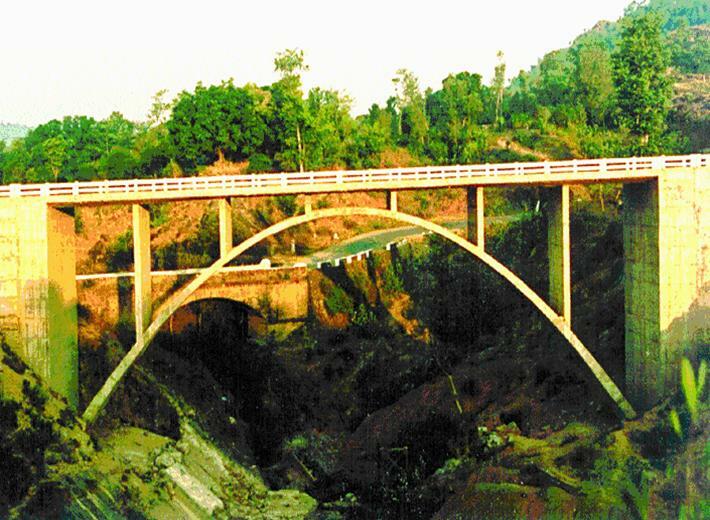 Built in scenic mountain ranges and snow-capped peaks to the order of the Himachal Pradesh PWD, this open-spandrel concrete arch bridge lies near Dharamsala in the Kangra Division. Bridge aesthetics was one ol the major concerns during the evolution of the conceptual design and in selecting the thickness, disposition and proportions of the concrete elements The high embankments on either side of the bridge induce pressures on abutments corresponding to 20m earth fill To affect overall economies in the 40 m effective span arch bridge all the main structural elements (i e arch, spandrel columns, deck slab and abutment walls) have been made monolithic Though this induces complications in structural analysis, aspects of durability and maintenance-free service conditions are heightened considerably as a result. 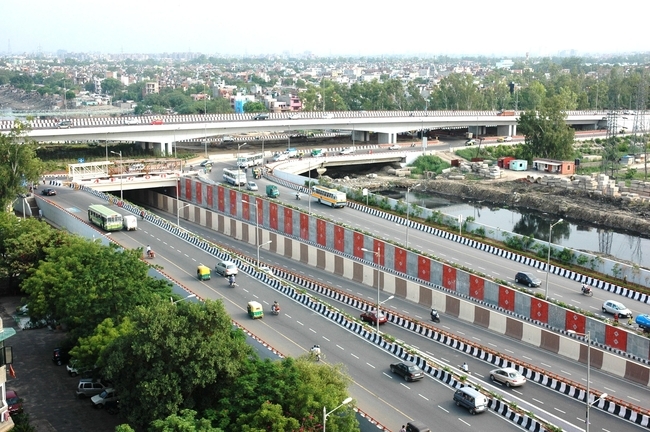 The 3-level grade separator was constructed on the critical intersection of NH-24 & Road no.56 in East Delhi and was before the Commonwealth Games 2010. 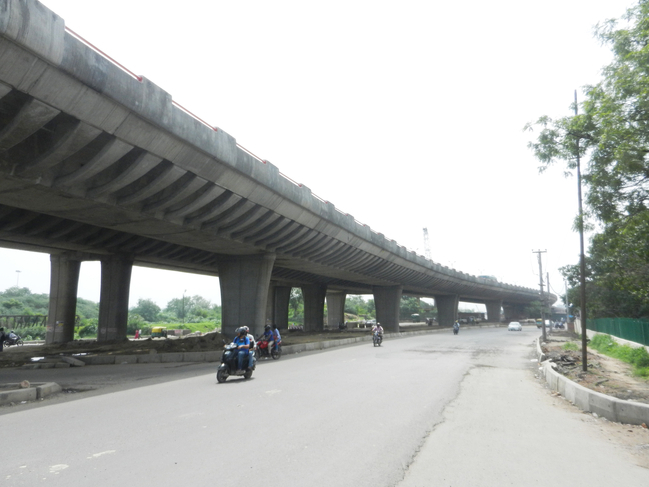 A flyover is aligned along NH-24 and an Underpass perpendicular to it. The existing rotary at ground level was retained but modified to suit the structural arrangement. 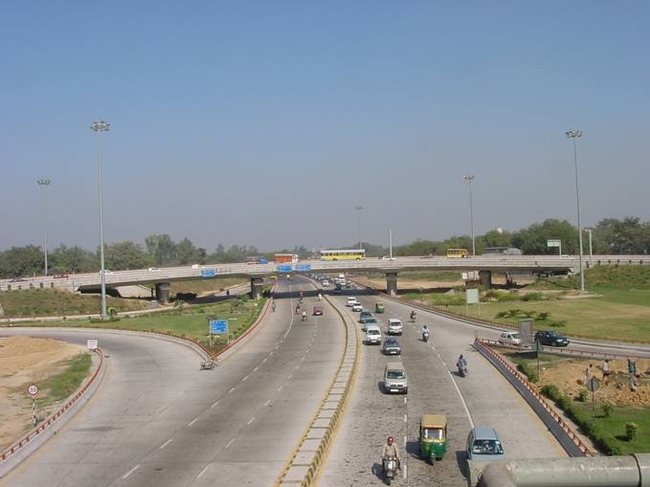 The 800m long flyover consists of 2 separate carriageways of 4 lanes each. 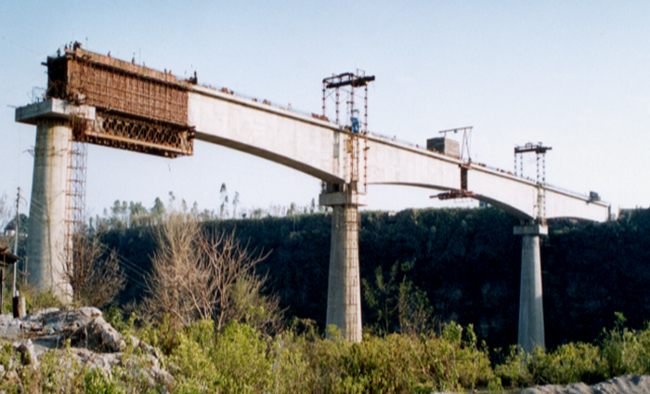 The “twin-leaf” substructure is monolithic to the superstructure to constitute an “ integral” bridge. Cast-in-situ balanced cantilever construction was adopted to yield 4-span and 3-span modules. 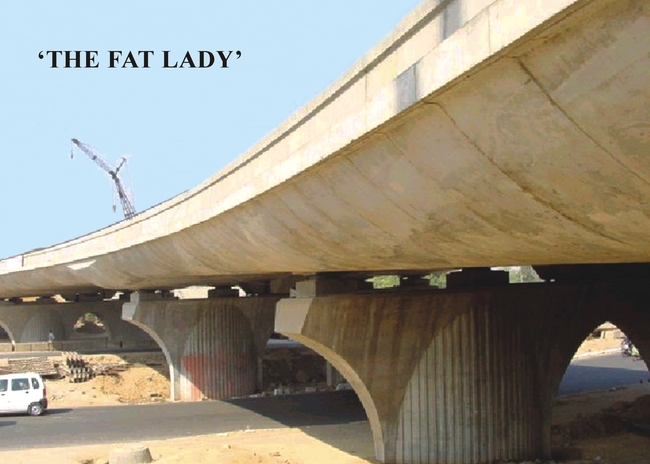 The 680m long Underpass is constructed using diaphragm walls along its periphery. 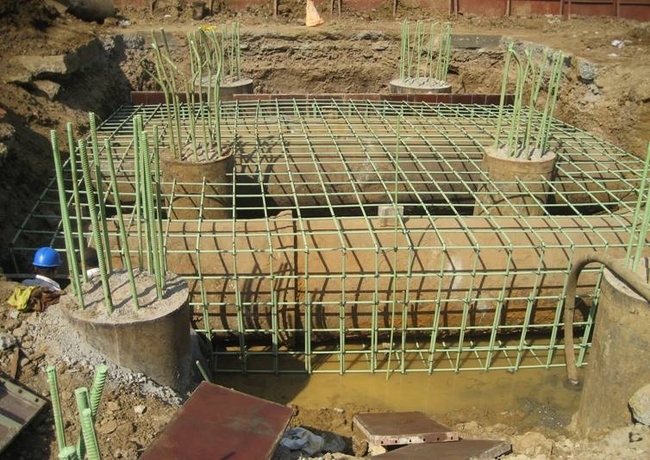 Tension piles were used with the base slab to counteract uplift due to the high water table. 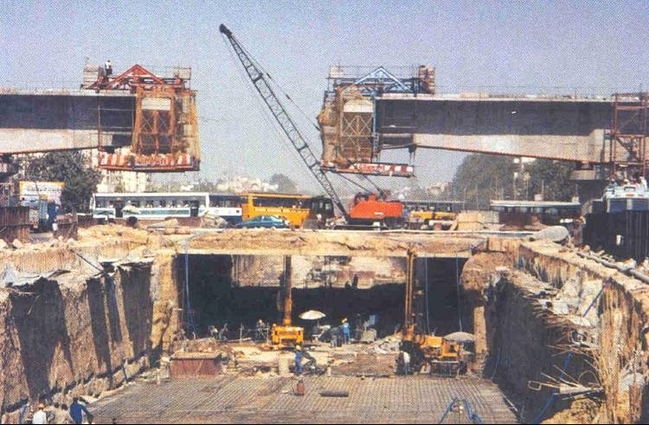 The portion of the Underpass crossing the rotary was covered with a deck slab cast into the diaphragm walls. Proof Consultant: Construma Consultancy Pvt. Ltd. Architect: Archohm Consults Pvt. Ltd. 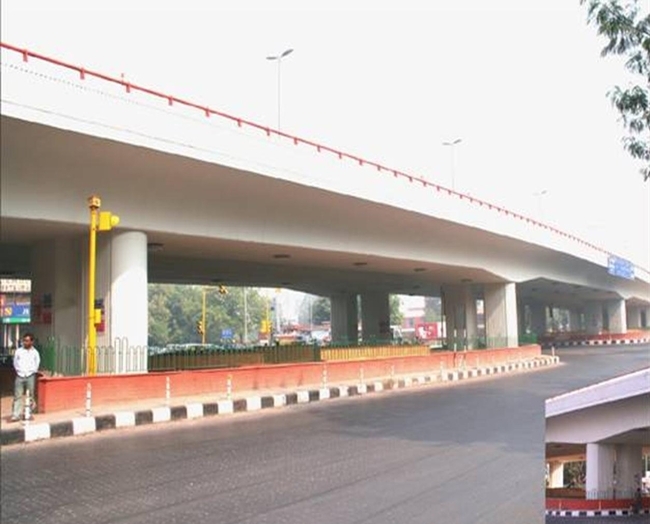 Commissioned by the PWD Government of Delhi for the Commonwealth Games (CWG 2010), the elegant design of Barapulla Elevated Corridor was envisaged as a dedicated signal-free access to transport participants from the Games Village to the Main Venue (Jawahar Lal Nehru Stadium). 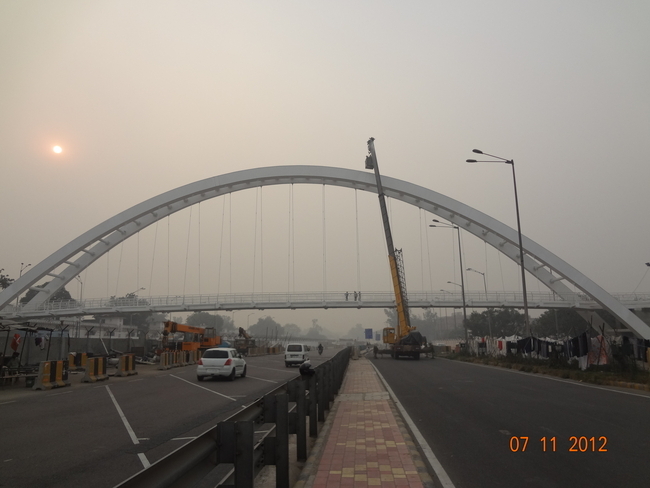 Located along the existing Barapulla Nallah drain, the 4.5 km long viaduct consisting of 2 separate structures of 10m width each for the up and down traffic has an important legacy value for the east-west traffic. 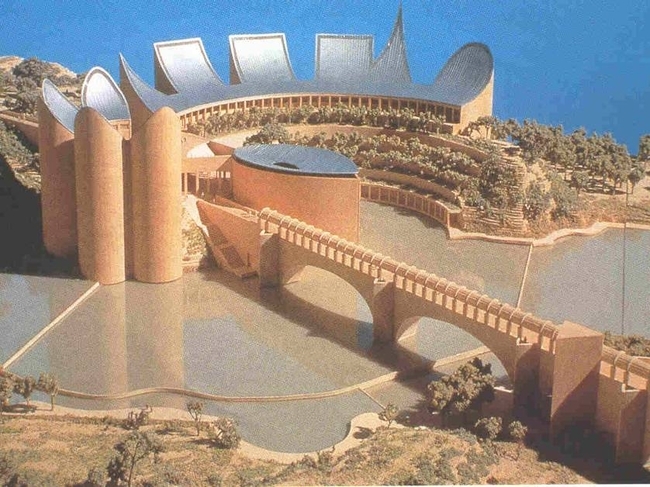 The innovative design concept was geared for high speed construction (time available: 20 months) using precast prestressed segmental techniques (no. of segments 3000) for most of the alignment including obligatory spans (upto 85.0 m). Standardisation was the key to cost-optimisation while decreasing the expansion joints in the deck led to increased riding comfort. Flexibility in design for accommodating modifications in alignment, span arrangement and foundation configuration contributed greatly in avoiding relocation of underground and overhead utilities. Delhi is a city of archeological monuments and a highly sensitive approach is required to be taken for their preservation. Each of the major crossings presented difficult challenges. For instance, the block-time for the Northern Railway tracks was limited to a mere 2 hours on alternate days, while the deck level had to be raised to 20m to provide an uninterrupted view of the Khan-i-Khana Tomb on Mathura Road. Sharp curvatures and skew crossing characterised the alignment to avoid crossings above the ancient Barapulla Bridge and to ensure that the elevated corridor can be built without showing on shutting down traffic. 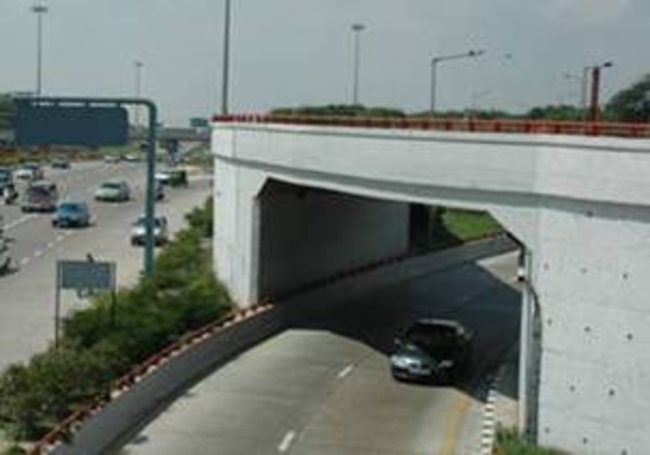 Structural design consultancy for Wazirabad approaches flyovers located on the western and eastern bank of Yamuna River, Delhi which involves nearly 50000 sqm of open portion of elevated flyover, 25000 sqm of closed portion of viaduct , 90000 sqm of embankment. 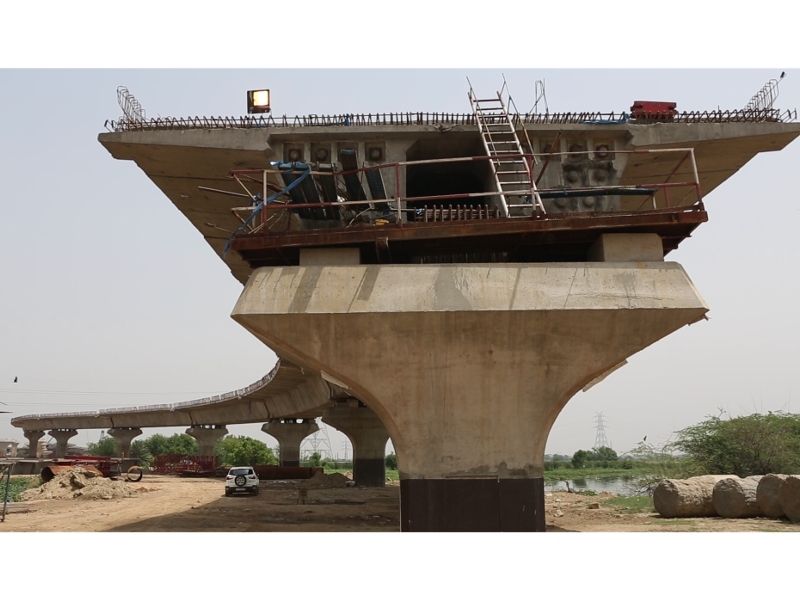 It is proposed to adopt precast segmentally constructed, four span continuous curved box girder of 164.5m length as a standard continuous unit. However the length & nos. of spans in a continuous unit will be varied depending on site constraints. Wide precast superstructure deck will be further split into a spine box girders & side frame cantilevers. 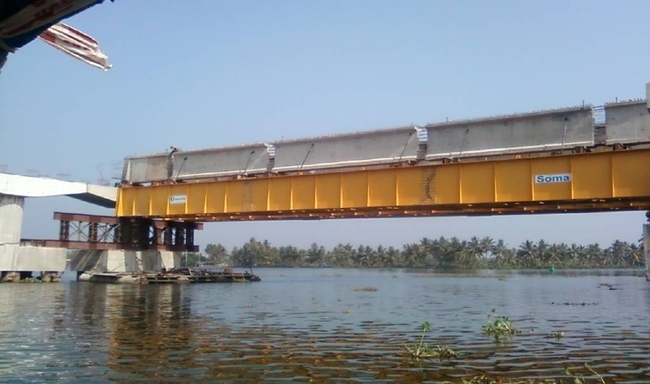 Cantilever construction or span by span construction method using launching girder will be employed. 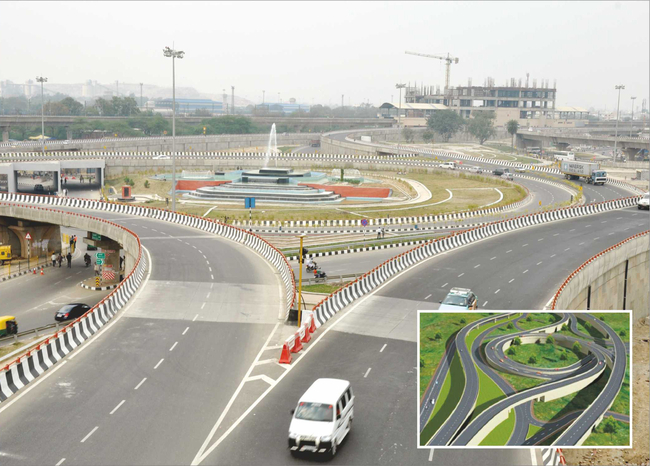 Built by the Public Works Department, NCT of Delhi, the gigantic traffic interchange at Mukerba Chowk, is located on the outskirts of Delhi. This complex junction facilitates signal-free movements in all directions at the intersection of the historic Grand Trunk Road (National Highway No. 1) and the Outer Ring Road. 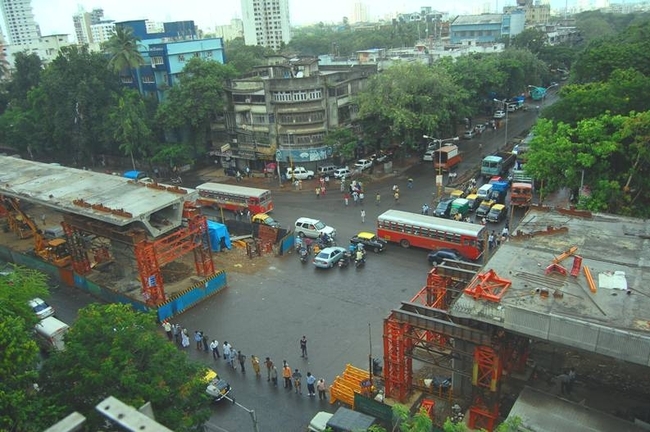 Traffic studies (year 2000), revealed that the mixed traffic had reached 3, 30,000 PCUs/day making it the most heavily trafficked junction in the country. 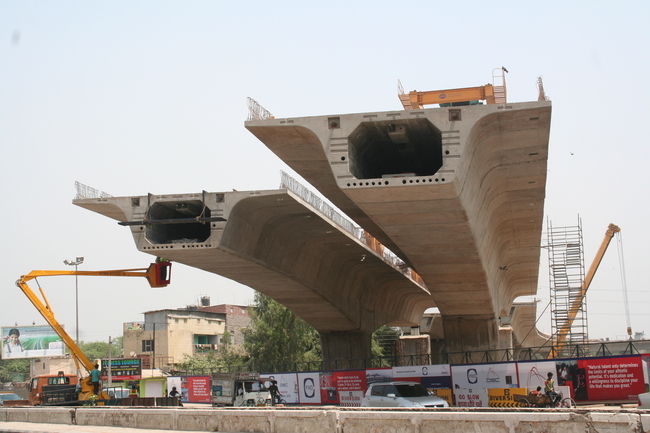 The path-breaking 8-lane main flyover consists of a continuous steel box girder (B1) with a composite concrete slab. The superstructure has been widened to 10-lanes to incorporate bus-stops (B4) at deck level that cater to facilities like ramps, stairs and escalators for vertical movement and under-bridges for cross-overs for passengers. The aesthetically designed slip road and loop structures are of integral concrete bridge construction, allowing for the elimination of bearings and expansion joints. 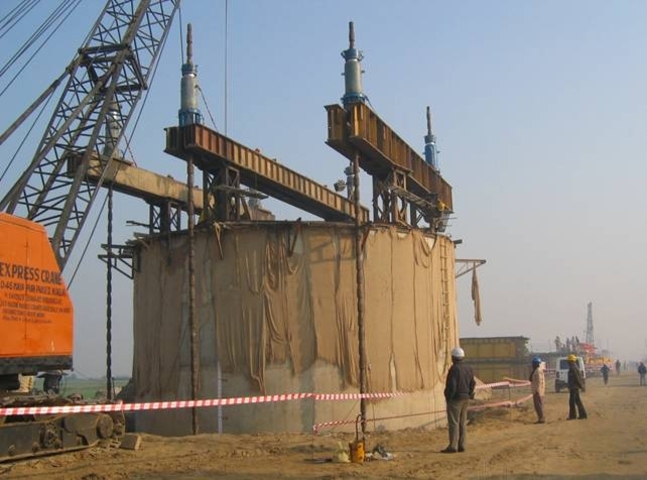 The structures have specially designed features for earthquake resistance (B2) as well as those that cater to poor soil conditions that have a high liquefaction potential. 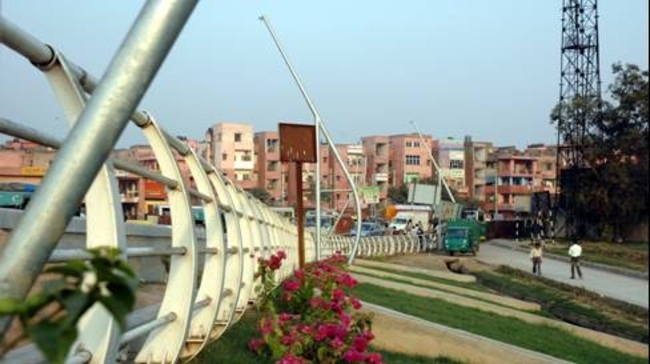 The Mukerba Chowk intersection which was conceived as a green project threw up design challenges in the form of the city’s garbage dump and several nallahs existing at the site. Use of flyash, blast furnace slag cement, segregation of motorized vehicles from cyclists and pedestrians, integrating the existing features at site (archeological monument, burial ground, and sub-station) and creation of innovative and aesthetic structural designs (B3) were some of the highlights of project. 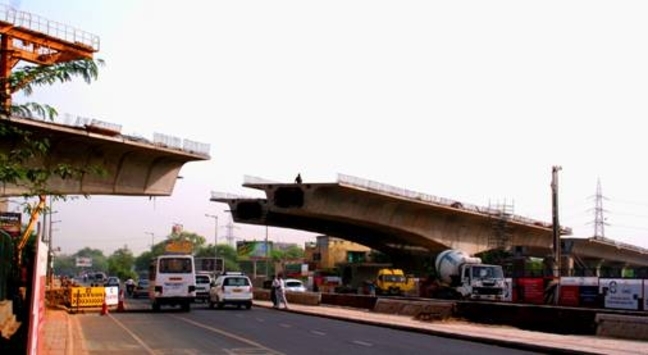 PWD, Delhi commissioned the seven span continuous Integral Flyover, with 190m long stilted portion, on Ring Road Intersection at Panchcheel Club. The superstructure is reinforced concrete voided slab type deck which is made integral (monolithic) with the piers. 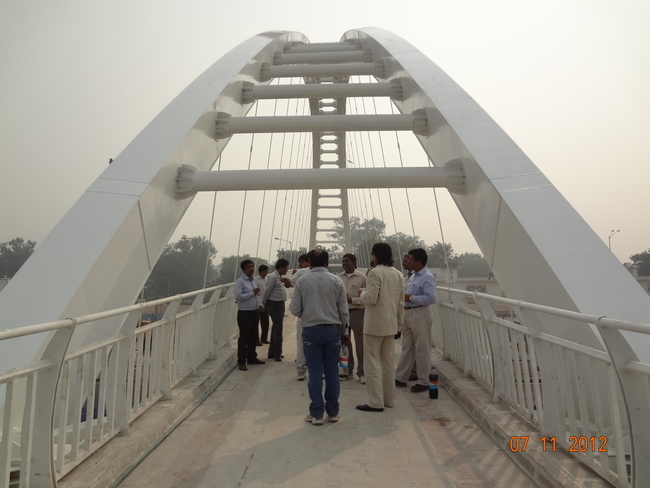 Coupled with other three similar integral bridges at Kalkaji Temple, Moti Nagar & Punjabi Bagh Club Intersections on outer Ring Road and Ring Road, New Delhi they are landmarks in this historic city and fore-runners of many similar bridge projects. 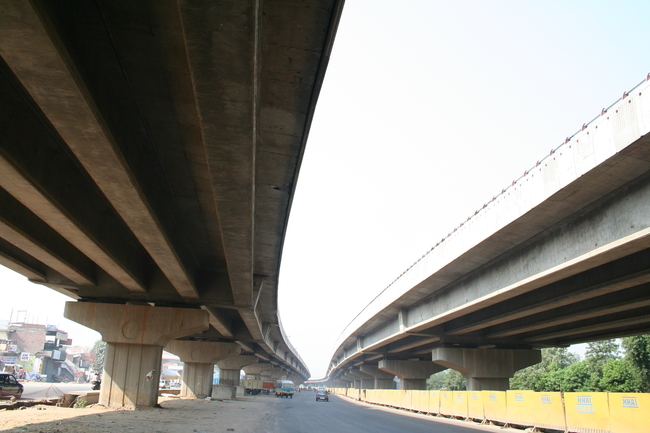 The flyovers were designed for seismic (zone IV) and duly account for superstructure. The Jammu-Udhampur Rail Link project was constructed to the orders of Northern Railway over a stretch of 53.6 km. 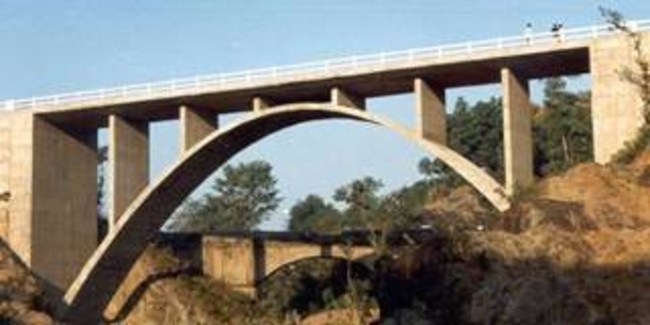 The alignment passes through breathtaking scenery of mountains and streams in the Undulating Shivalik Ranges which inspired the engineers to evolve structural conceptions reflecting the beautiful environs. 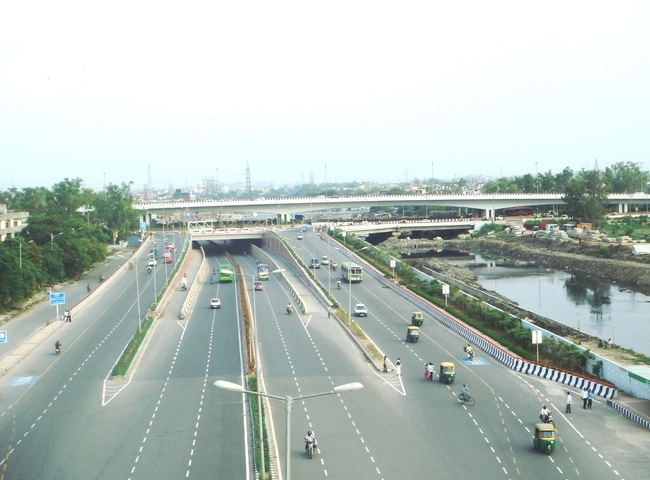 At the intersection of Outer Ring Road and Road no.41 at Madhuban Chowk, New Delhi, two major fast-track projects were constructed simultaneously. 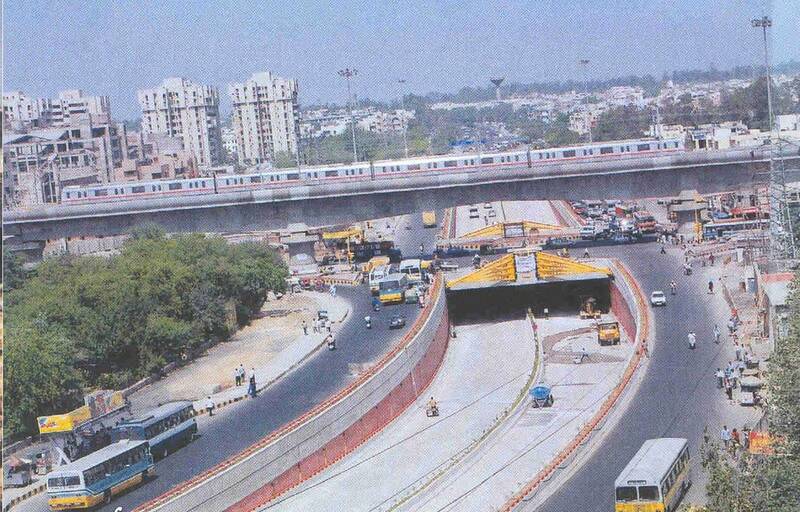 A vehicular underpass was opted for Outer Ring Road by DTTDC while the viaduct of the DMRC runs perpendicular to it. Sequencing of activities for these two fast track projects in a restricted area, use of appropriate construction techniques and limited disturbance to existing traffic during construction were some of the problems overcome by innovative designs. 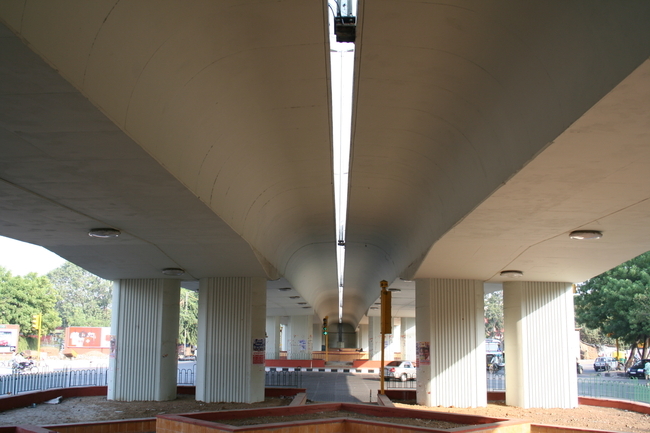 The 6-lane 555m long underpass for DTTDC is constituted by 18m deep diaphragm walls on the sides connected by a base-slab. Permanent prestressed soil-anchors are used to stabilize the structure against uplift caused by the high water table in the area. 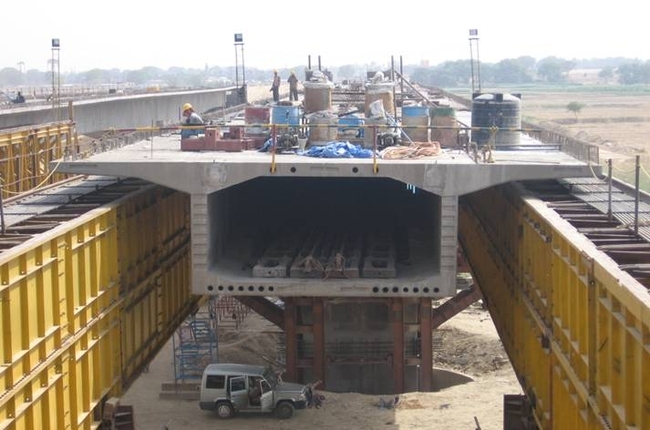 A 60m long prestressed voided slab monolithic with the diaphragm walls spans across 24m width of the underpass to facilitate traffic movement at ground level. 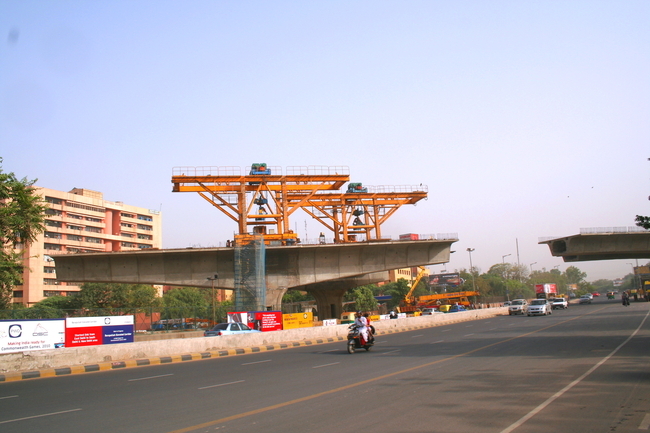 Of the several special viaduct structures of Line 1 of DMRC, one of them is the 2-track, 3-span (38.5m + 55m + 38.5m) bridge constructed by free-cantilevering technique, ensuring no disturbance to traffic at ground level. The central span straddles across the underpass with piers supported on the central verge of Road no.41. Special attention was devoted to aesthetics, durability and earthquake resistance. Heavy traffic congestion existed at the Rotary outside the Domestic Airport, Delhi. It was found that majority of the congestion was due to the large traffic volume plying between Delhi & Gurgaon going towards Dwarka. 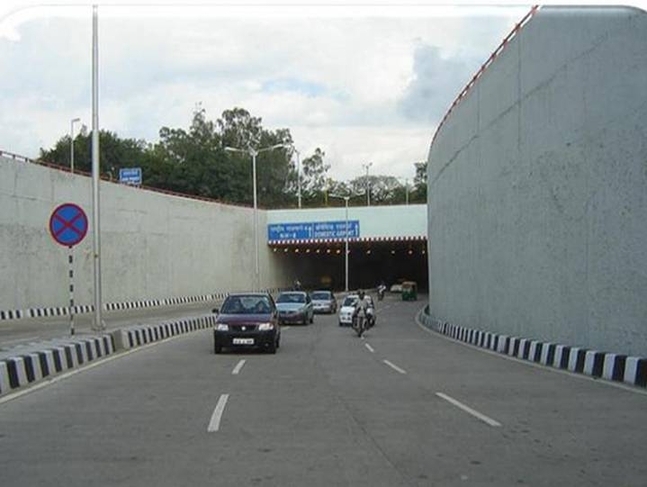 A one way 600m long underpass from Delhi (Dhaula Kuan) and Gurgaon towards Dwarka, below the existing Rotary was thus concerned (Fig 21). This was a most fortunate selection as an elevated structure in the vicinity of the terminal building would have spoilt the cityscape. Sometimes it is infinitely better to be unobtrusive and subtle in matters of infrastructure. This was one such occasion. A combination of Diaphragm Wall (D-Wall) and Retaining Wall was made to find an optimum of construction time and cost and yet feasible construction. 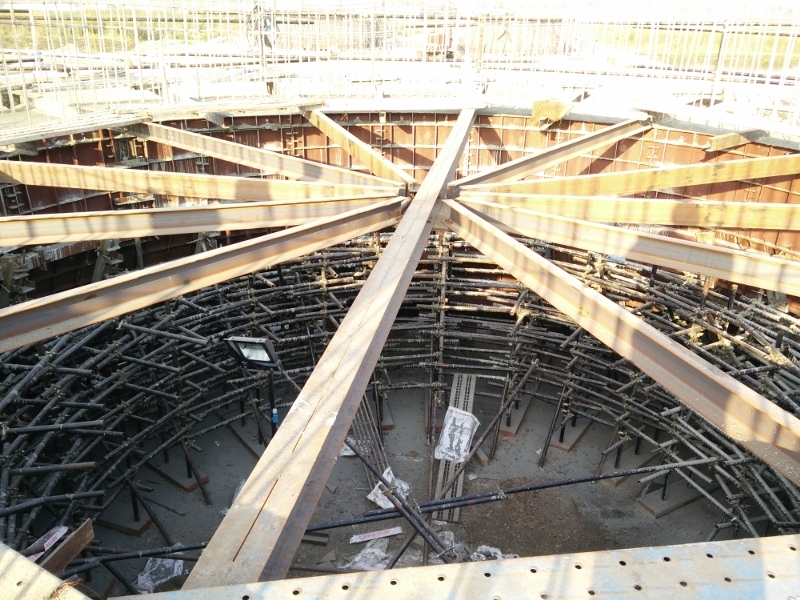 Fig 22 shows diaphragm wall with temporary bracing which was required before casting of base slab for the permanent connection. At certain places, underlying rock is comparatively shallow, though still below the base slab of the underpass. A specialised design detailing had to be prepared to tackle such locations. The covered portion below the rotary is 120m long. 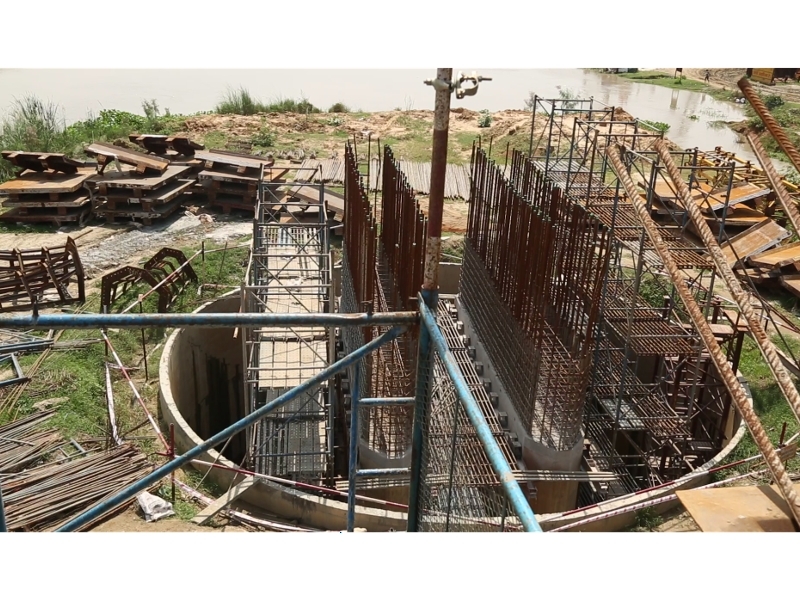 Adequate arrangements for drainage of the underpass have been made, by way of installing several submersible pumps (with 50% redundancy), controlled through logical controller and fully backed up with DG Sets. 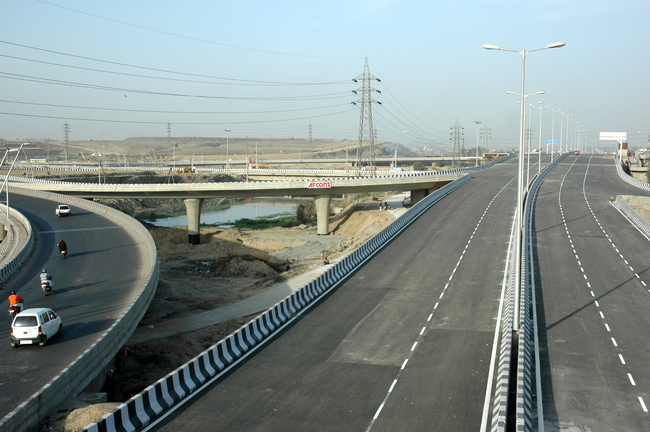 Special highway geometrics were required to merge NH-8 with the underpass due to the limited land availability at the Dhaula Kuan end. Special attention was devoted to the development of visually arresting aesthetic features of the project. Carefully shaped spine beams of the superstructure resting on elliptical piers of fluted texture were the main highlights. 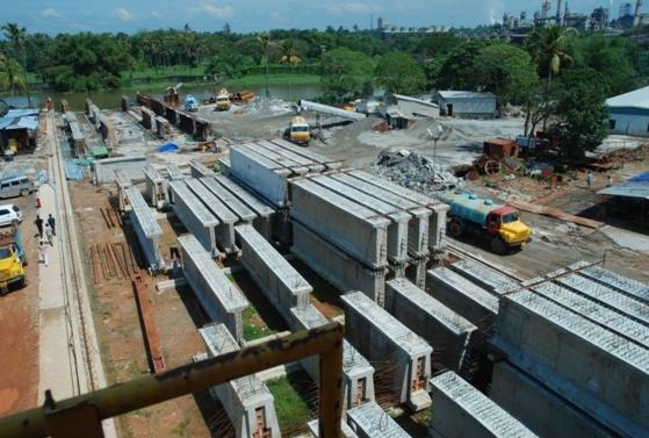 The 6-lane superstructure consists of precast prestressed segmental construction of five continuous spans of 26.1 + 31.05 + 41.4 + 31.05 + 26.1 m. The precast segments were manufactured at a centralised casting facility located in the contractor's compound from where they were transported to site and erected in position by light assembly trusses. Apart from fast track construction (16 weeks per flyover for the superstructure) other environment friendly aspects included: minimising on-site concreting and causing no disturbance to traffic during construction. The rather complicated grade-separated interchange at Dhaula Kuan represents the gateway to the Capital city from the airport. 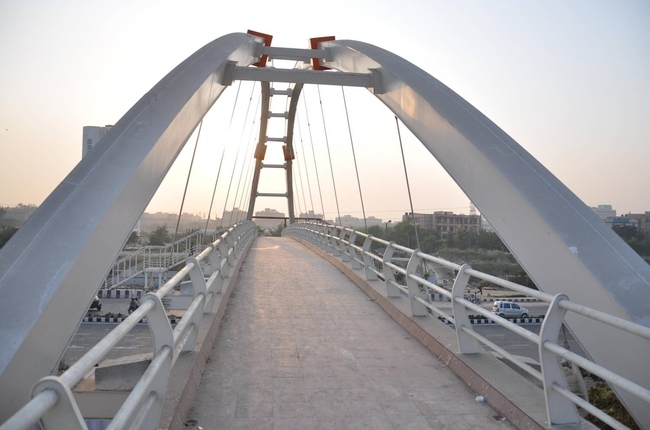 Due to its sheer size and importance in sociological terms, a bridge looms prominently in public consciousness and these facts cannot be ignored. Disregarding its harmonious integration into the natural or built environment can have significant repercussions, the detrimental effects of which are always significant. It has been found that at later stages, the corrections from aesthetic considerations of badly conceived solutions can only result in marginal or cosmetic improvement. Graceful and aesthetic bridges elicit a sense of appreciation from lovers of natural beauty. Smooth and elegant flyovers earn the unmitigated gratitude of millions of urban dwellers enhancing quality of life in the cities. 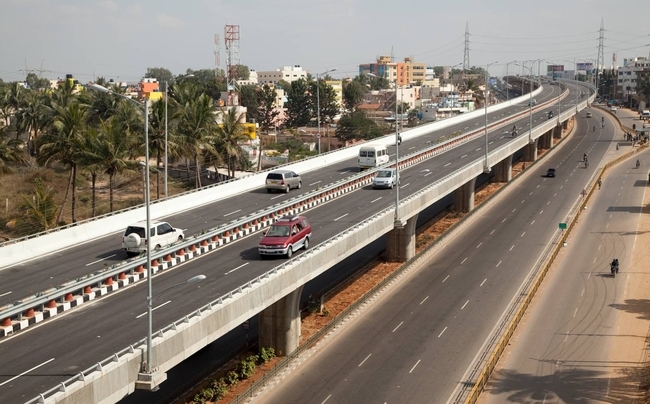 The 10km long 4-lane Bangalore – Hosur Elevated Expressway Project on NH-7 is one of the most heavily trafficked sectors (1,25,000 PCUs/day) in the country. 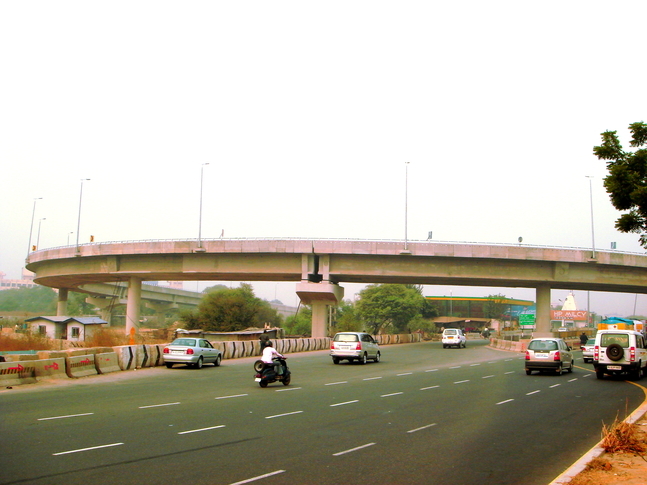 The elevated structure starts from Silk Board Junction and ends at Electronic City. The work was awarded on BOT Basis by National Highways Authority of India to a consortium of companies as JV partners. 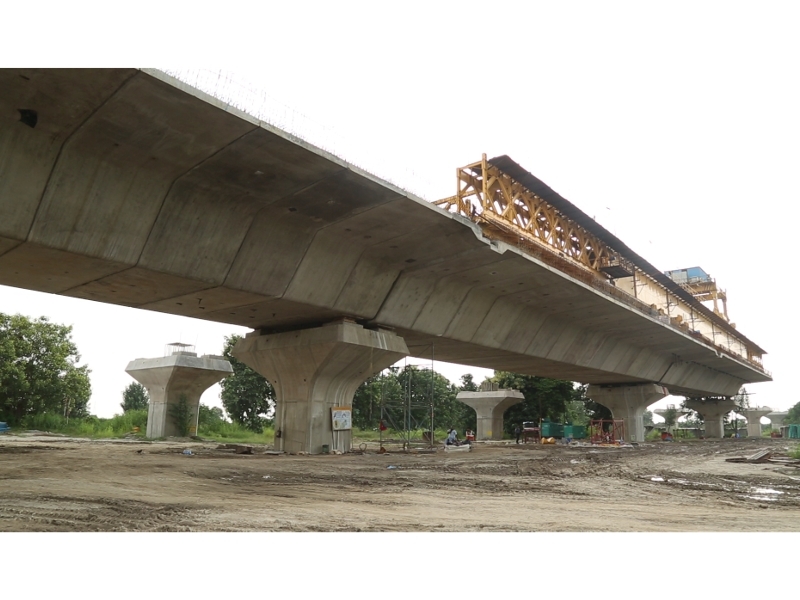 The 16.3m wide deck of the bridge superstructure consists of State-of-the-Art precast prestressed segmental 2-cell box girder construction and several complicated interchange structures and ramps connected to the main expressway. 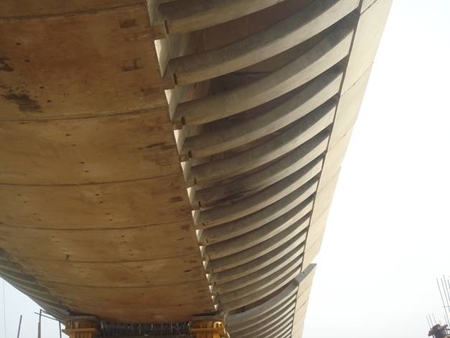 The typical span arrangement between expansion joints of the main bridge is 29.0m+6*34.0m+29.0m=262.0m. Pedestrian crossings (4 nos.) have been designed by ‘box pushing’ to avoid inconvenience to existing traffic at ground level. 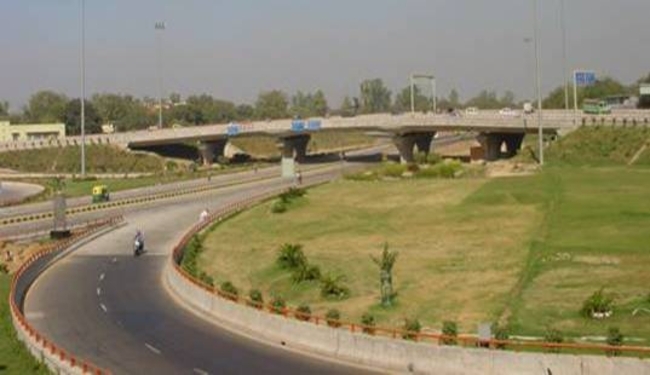 Additionally, two flyovers cross the alignment at different locations are also included in the project. 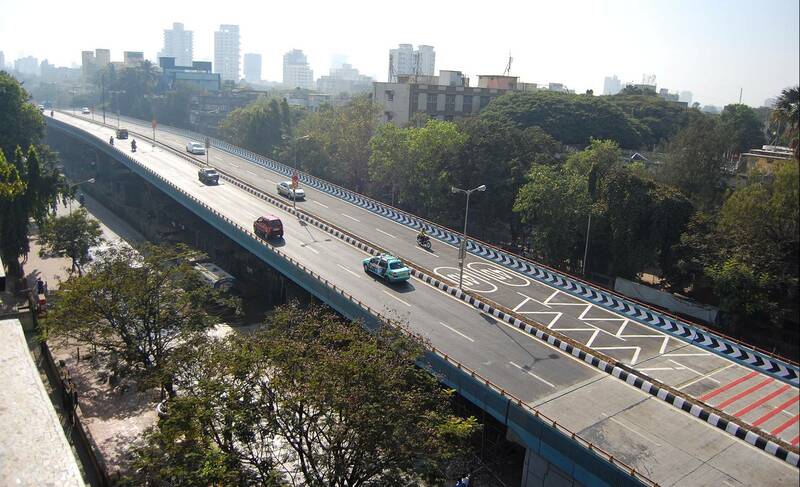 The flyovers on Ambedkar Road span across crossings at Sion Hospital, Hindmata Junction and King Circle. Large diameter water pipelines and other utilities posed a big challenge to the design and construction in the congested traffic artery. Pile foundations in uncertain sub-strata consisting of disintegrated rock added to the difficulties encountered during the execution. 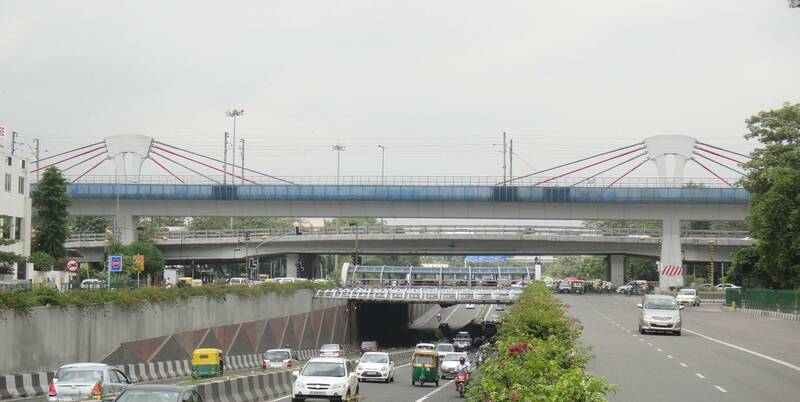 To alleviate the heavy congestion of traffic at the ITO crossing, two clover leaves and slip roads have been constructed connecting Vikas Marg at the lower level to the IP Estate Flyover (on Ring Road) at the upper level. The total length of the elevated clover leaves is 513.0m. The 1013m long bridge across the River Ganga near Allahabad is located on the Khaga-Varanasi section of National Highway No. 2 Separate structures were designed for 2 lanes each for the up and down traffic. The span arrangement selected was 63.2m + 4x95m + 63.2m = 506.4m. 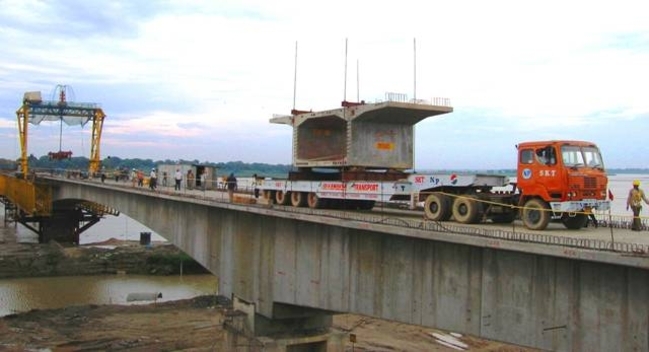 Two such units with expansion joints (modular strip/box steel type) at the midway point make up the bridge length. Shock Transmission Units (STUs) were incorporated for countering earthquake forces in an efficient manner. Precast segmental construction was used for the superstructure with a parabolic soffit to get a high quality product with excellent finish and fast erection speed. 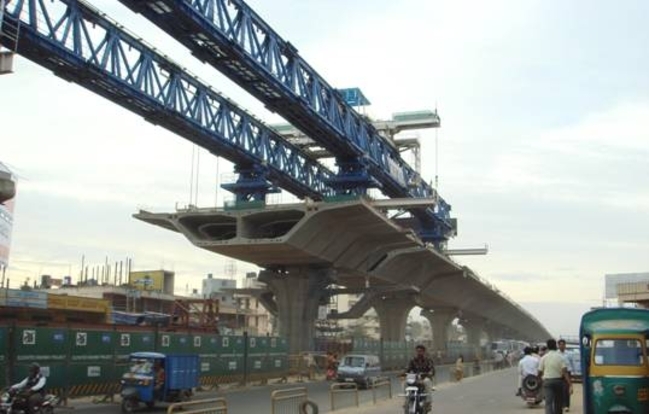 Independent underslung launching trusses of 230m length were used for erection and placement of segments (governing weight 80t) employing portal gantries. Jack-down well-sinking was employed for the foundations for speeding up construction and for greater control over tilt and shift. This bridge (Bridge no. 7) is a part of the Port connectivity Link being developed by NHAI connecting various islands with NH-17. 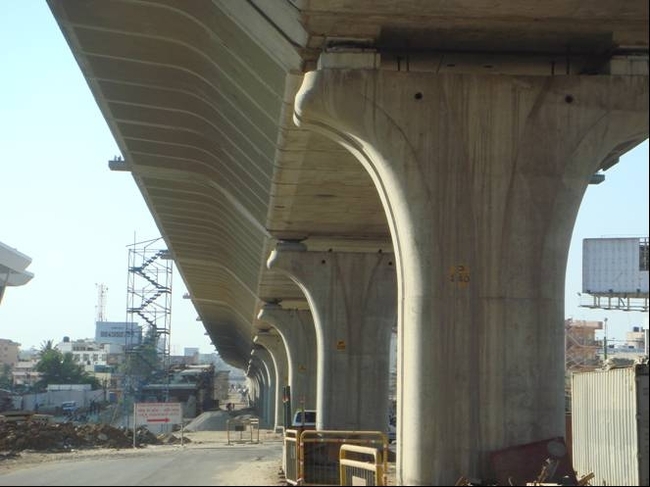 The structural system consists of simply supported spans resting on very deep pile foundations. The superstructure has been re-engineered to make it construction friendly by employing precast segmental post tensioned girders. The girders are precast in parts and spliced together with the aid of prestressing on top of assembly girders. This greatly facilitated transportation by pontoon and handling of the girders by floating crane in the creek. 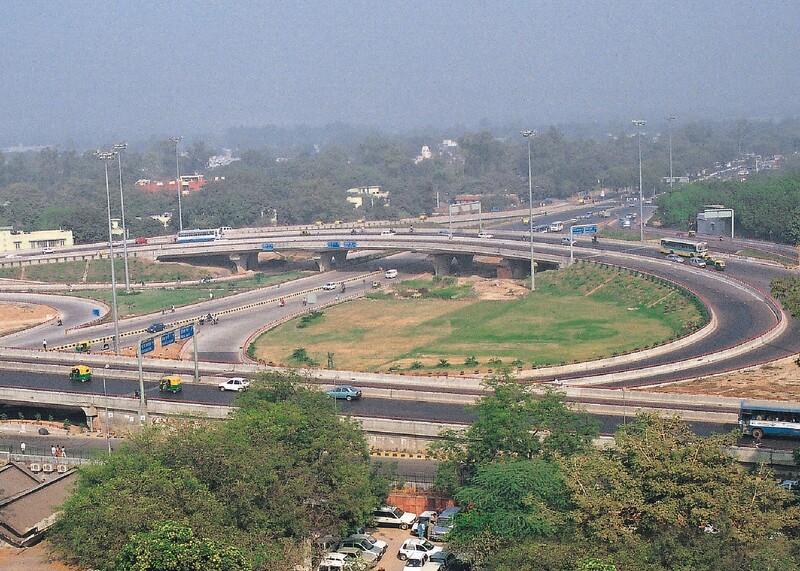 Built to the orders of the PWD, Govt of Delhi, the grade separated interchange at the AIIMS-Safdarjung crossing has given back a green lung to the city. Located at the intersection of Ring Road and Aurobindo Marg junction, the landscaped interchange is signal free and of low height which not only reduces atmospheric and noise pollution but also enhances the quality of the environment. The bridges and structures being the most visible elements have been specially designed to blend aesthetically into the milieu. The continuous decks with smooth flowing lines and contours impart a strikingly attractive character and openness to the scheme. The spill-through abutments are immersed into the landscape, giving the impression of bridges emerging gracefully out of the ground. State-of-the-art earthquake resistant construction with unobtrusive features are amongst the highlights of the structural design. Precast Pre-tensioned girders integrated with cast-in-situ deck slabs and diaphragms were used on a large scale for the superstructure of the 2 x 4 lanes of the access-controlled expressway incorporating several grade separators aggregating 11 km of stilted structure. 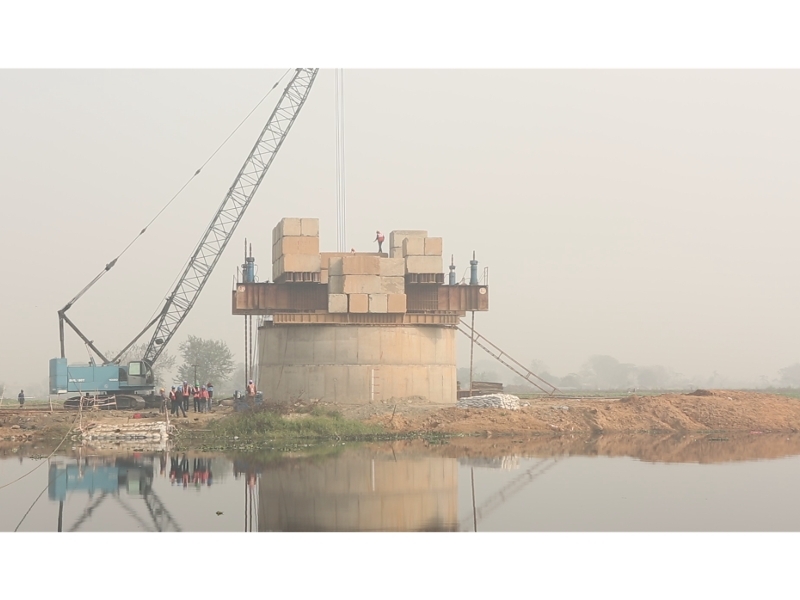 Constructed to the orders of the National Highways Authority of India, this BOT project is characterized by high quality, superior form-finished concrete with an eye on simple structural elegance, durability, economy and standardization. The requirement of precasting 1800 girders was met through a casting yard comprising 14 beds and a process of steam-curing to obtain a time cycle of upto 4 girders a day. Specially fabricated low-bedded trailors were deployed to transport the 30 m long girders (weight 60 t) to the site and a pair of Goliath cranes operating in tandem was then used for their erection (A). A pair of 150t tyre-mounted mobile cranes was also engaged at designated locations for the purpose (B). The erection methodologies are shown in the insets. 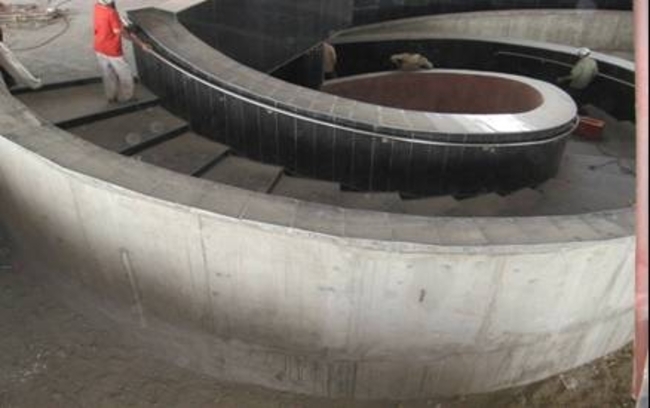 Special highlights of the designs were the “integral” sharply curved (radius 50 m) prestressed cast-in-situ box girder continuous decks for the “horse-shoe loop” connections towards the international (C and D) and domestic terminals of the IGI airport of Delhi. 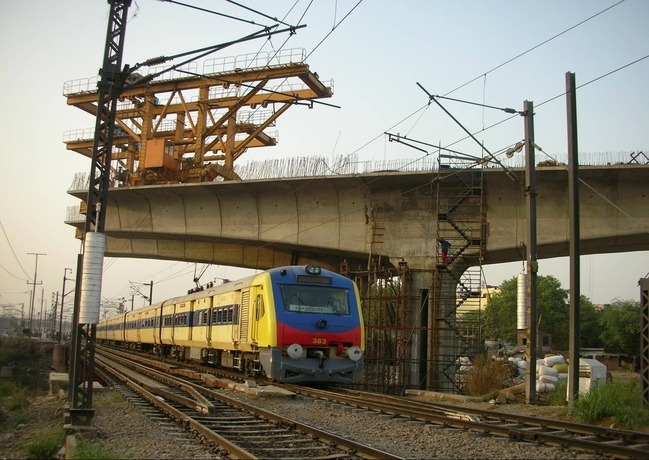 Also, post-tensioned precast girders of 40 m length (weight 120t) were employed for obligatory spans at major crossings. The concept of hanging girders was exploited advantageously to maximize road usage for ground level traffic (photos opposite). 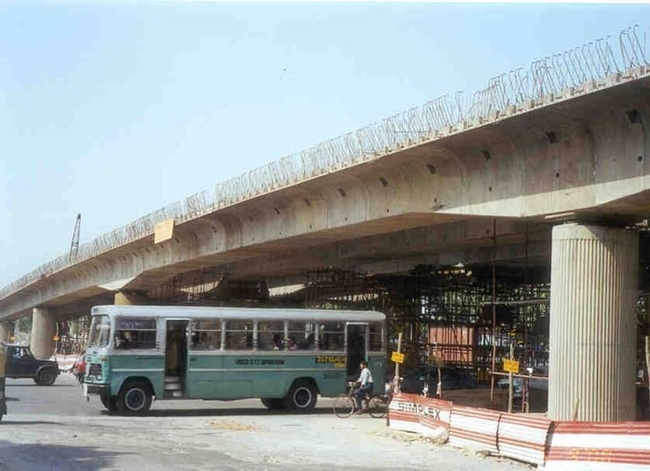 A 1.5 km long flyover in the heart of Hyderabad’s commercial and business centre, was constructed for crossing 3 important junctions at Rajiv Gandhi, Punjagutta and NFCL. 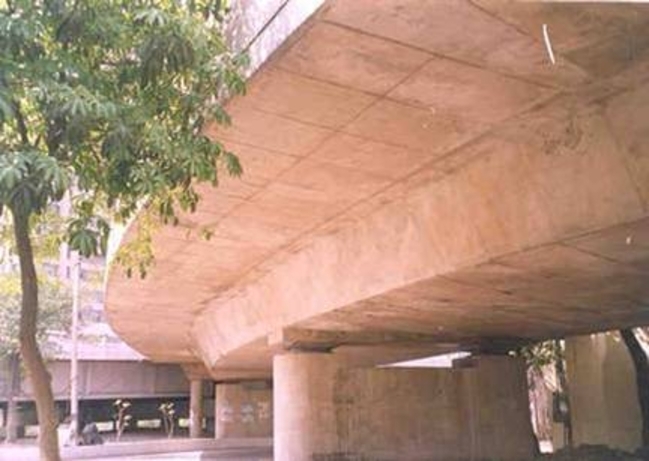 Precast Segmental construction using continuous spans for the deck was selected as the most suitable alternative to reduce disturbance to existing traffic. Surmounting challenges posed by underground utilities often dictated the design. Aesthetics, durability and environmentally sensitive shapes were conceived to suit the sensitive loaction. 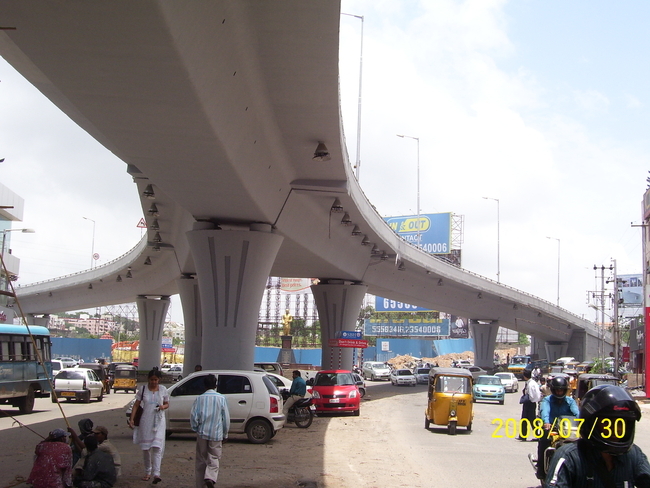 The main flyover is supplemented by 2 auxiliary ramps at the Punjagutta junction. Barpullah Ph. III is a flagship project of Delhi PWD, GNCTD after the successful completion and appreciation of Barapullah Ph.I & Barapullah Ph. II (currently known in Delhi as Baba Banda Singh Bahadur Setu). Barapullah Ph. I was commissioned by the PWD, Delhi for Commonwealth Games (CWG 2010) and was appreciated greatly by common people as it reduced the travel time along Mahatma Gandhi Road (Ring Road) in Delhi. Barapullah Ph. II and Ph. III were conceived after the success of Barapullah Ph. I. Barapullah Ph. 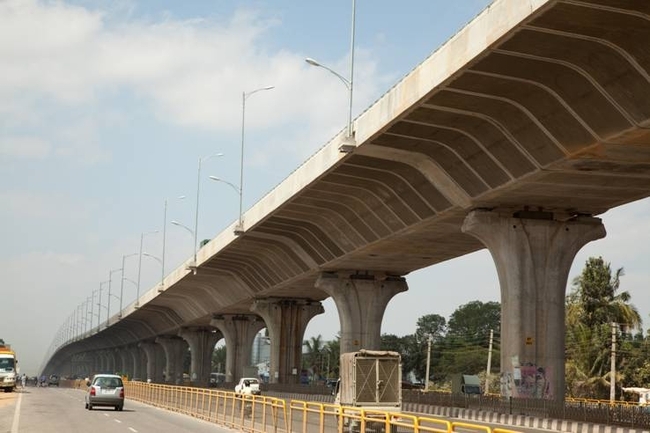 I was also designed by Tandon Consultants Private Limited and it consists of two 4.5 km long viaducts consisting of two separate structures with 10 m deck width each. Barapullah Ph. I project starts from JLN Stadium and ends at Sarai Kale Khan. 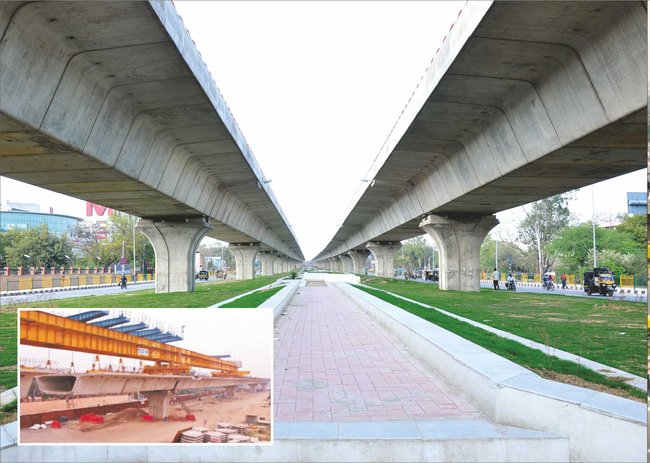 Barapulla Phase III project extends the same viaduct and connects Sarai Kale Khan with Mayur Vihar crossing river Yamuna. It predominately contains 2 separate carriageways each 12.5 m wide for either side of traffic. Additionally footpath and cycle track with widths 1.5 m and 2.5 m respectively are provided for either side of traffic. 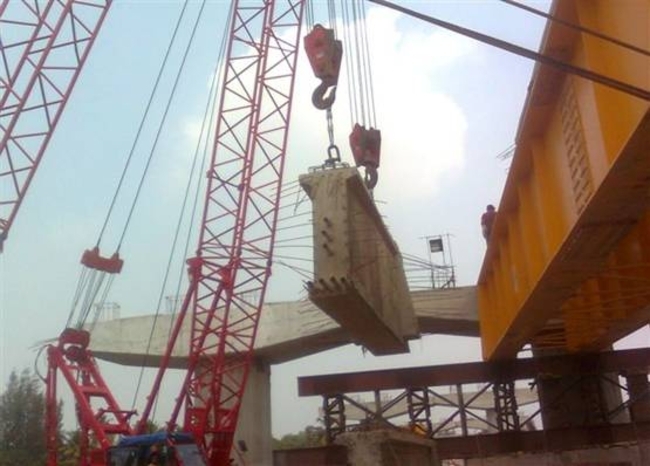 Thus, making a total deck width of 17.85 m for each post tensioned segmentally constructed box girder. 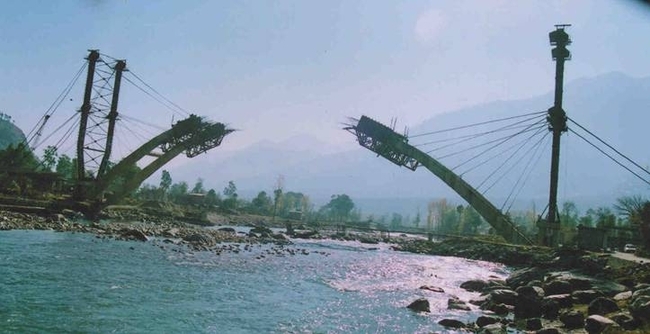 Crossing river Yamuna is an iconic Extradosed Bridge with span configuration 85 m + 127.5 m + 127.5 m +127.5 m + 85 m with an expansion joint with hinge beam arrangement at the center. 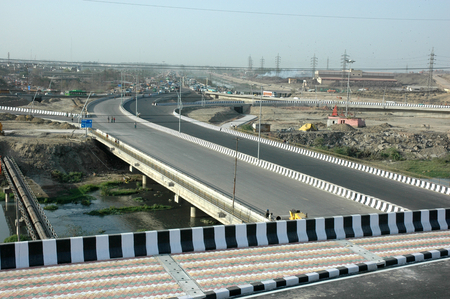 Thus, making it a continuous structure of 552 m span length for the main channel of river Yamuna. 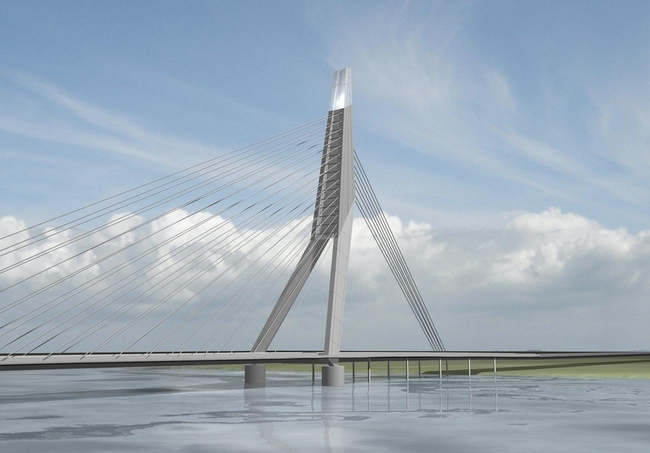 The Extradosed Bridge would be architecturally lighted to ensure more aesthetic appeal. The main viaducts opens up in four different loops at either ends to facilitate traffic on and off from not only Barapullah Ph. 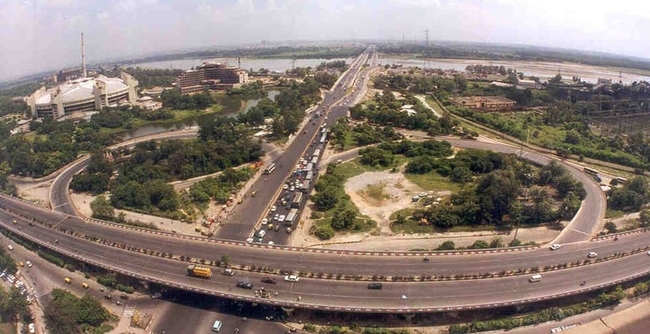 I or II but also Mahatma Gandhi Marg (Ring Road) and Akshardham Noida Link Road, thus making signal free connectivity from AIIMS (South Delhi) to Mayur Vihar (East Delhi) and Noida (Western UP). This will lead to reduction in travel time between these places by atleast 20 minutes. The structural arrangement for substructure and superstructure for regular viaducts and loops are kept in such a way that they look sleek and blend well with the natural landscape of the region. To be built over River Yamuna in North Delhi, the 575m long Signature Bridge will have a single inclined pylon of 150m height and a 251m span. Apart from providing a much needed additional crossing between the left and right bank of the river, it will be an iconic bridge of the city. 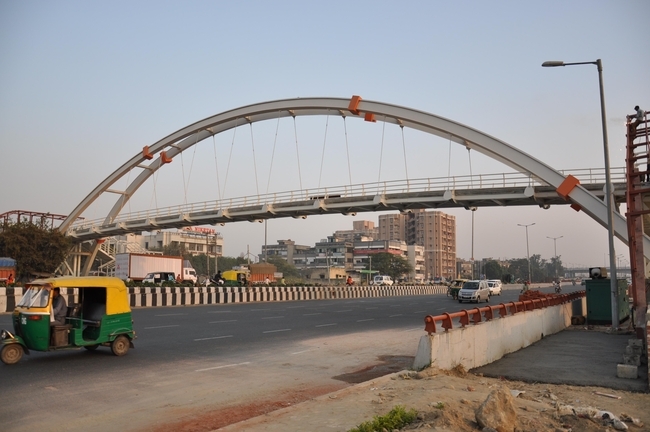 The Extradosed Bridge of Delhi Metro at Moolchand is an important crossing over Ring Road. It has a span arrangement of 51.0m+65.5m+51.0m making a total length of 157.5m with a curved alignment (R=100m). 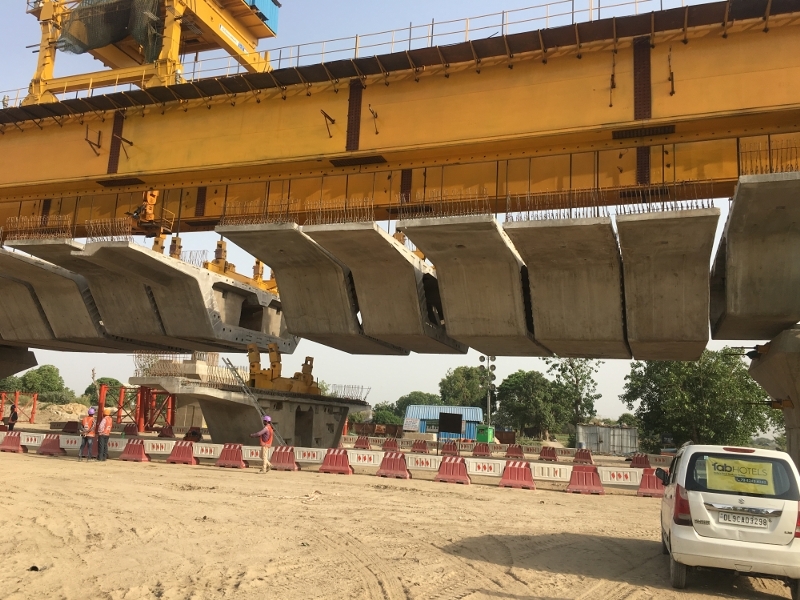 The 2.0m deep 10m wide box girder deck was constructed by precast segmental construction with an axial suspension of stay cables from 8.0m high pylons. No disturbance of traffic was permitted during construction at this heavily trafficked junction adjacent to which a flyover and underpass already exist.